The International Club here at the University of Freiburg is a pretty big deal. One thing they do is host Studitours, trips around Europe, for students. I decided to join the group going to Vienna, Austria this past weekend. After the initial sticker shock (I had to pay 220 Euro up front), I started to get pretty excited about it, because I hadn’t been to Austria at all yet and didn’t know when I’d have the chance to get there on my own. Then, I started to get scared, because I didn’t know anyone else going… my friend who first suggested the trip had to drop out due to a prior commitment. Ahhh! Luckily, everything turned out fantastically. The price ended up being way worth it (it covered transportation, hostels, and entrance to a few of the attractions we saw during the course of the weekend), I got to go to one of my favorite cities I’ve visited yet, and I met some pretty awesome people in the process! The one bummer about this trip was the long bus ride. We left at about 7:30 PM on Wednesday night (Thursday was a holiday) and got to Vienna at about 6 the next morning; on the way back we did about the same thing. This is a horrible time for a bus ride, but at least we didn’t waste 24 hours of daylight in a bus. Some of the highlights of the trip: a walking tour of the city, a (very touristy and probably overpriced) Mozart concert in the hall where young Wolfgang gave his first concert at age 6, Donauinselfest, authentic Wienerschnitzel, Mozart’s grave, a tour of Schönbrunn palace and gardens, Sachentorte at a Viennese coffeehouse, the Austrian National Library, and several delicious Radlers. The city itself was beautiful, albeit a bit under construction at the present. Of all the cities I’ve seen, it seems to be the most architecturally “together”, if that makes sense… all the buildings have this majestic, imperial feel to them, not just the ones who were actually once imperial. The Opera House was gorgeous, as expected, the palaces (the Hofburg especially) and the “ring” of current government buildings were imposing and grandiose, and the cobblestone streets are filled with horse-drawn carriages. My first night there, Thursday, some of us decided to try to go to the Opera. Looking back, I think we may have been duped into believing that there weren’t any standing-room tickets left, so we ended up going to a string quartet concert performing pieces by Mozart and Strauss. It was great nonetheless, and a good alternative to the planned amusement-park activity, since it rained the whole evening. The Schönbrunn tour Friday morning was great. It was smaller than some of the other palaces I’ve been to, but what I really loved about it was how authentically the rooms were decorated and displayed. We were also entertained by this hilarious Asian tourist family who insisted on taking pictures, which was strictly forbidden, and hence got chewed out by the guards several times, responding each time, “I just learned! 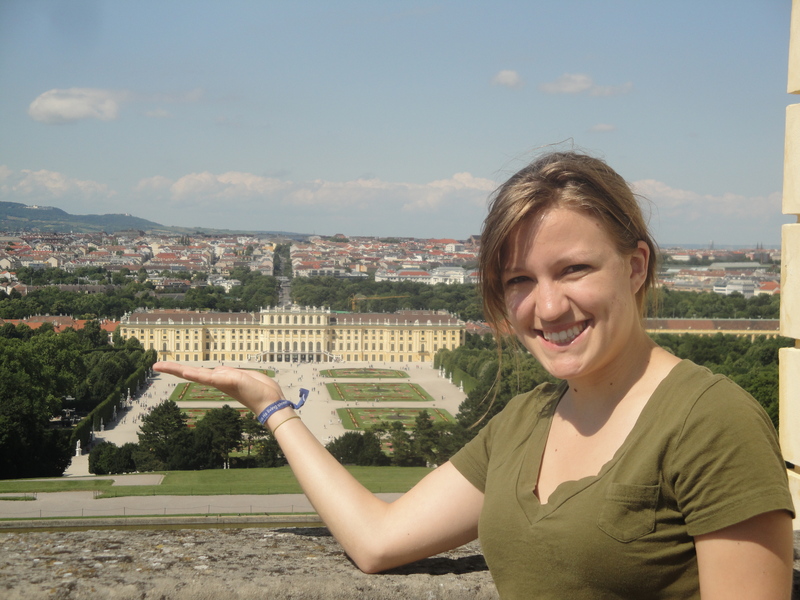 I just learned!” The gardens were really beautiful, too, and my new friend Ashley and I also ventured up to the top of the Gloriette, a huge arch built by Maria Theresia during her reign, to take in the view and take some goofy pictures. During some down-time, I decided to walk around a bit by myself, which is always one of my favorite things about traveling… just seeing where the city takes me. I ended up in St. Stephan’s Cathedral, thinking I could catch a 6 PM Mass, only to find that the schedule had been changed because of an ordination! I just happened to walk in right during the laying on of hands, which was pretty awesome. I came back like an hour later just to see the church and caught the end of the Mass, so I was able to see all the new priests processing out and greeting their well-wishers. It was incredible. And the church itself was beautiful. Friday night, we attended Donauinselfest, a GINORMOUS music festival on the island in the middle of the Danube River (hence the name). I don’t think any of us expected it to be such a big deal. From the information I’d been given about the festival beforehand, I was just expecting some sort of reggae concert. Which would have been cool. But when we got there, we discovered that it was, in fact, a huge deal, with more than 20 stages and carnival food of every sort and SO MANY PEOPLE EVERYWHERE. When I picked up a program and started flipping through it, one of the band names was familiar… Train. I love Train. I have loved train since I was like 10 years old. At first I was like, “Nooo, no way are they here at this random music festival in Vienna,” but decided to go over to Stage 6 anyway. We got there right in time to hear the announcers introduce the next “Grammy award winning” band (at which point I realized that it actually was the correct band) and for me to go completely crazy because they played one of my favorite songs as their opener. I may have scared some of the completely nonchalant Austrians around me. But that’s ok because I got to see Train live. FOR FREE. And I got to hear Pat Monahan try to speak German to the crowd. So awesome. 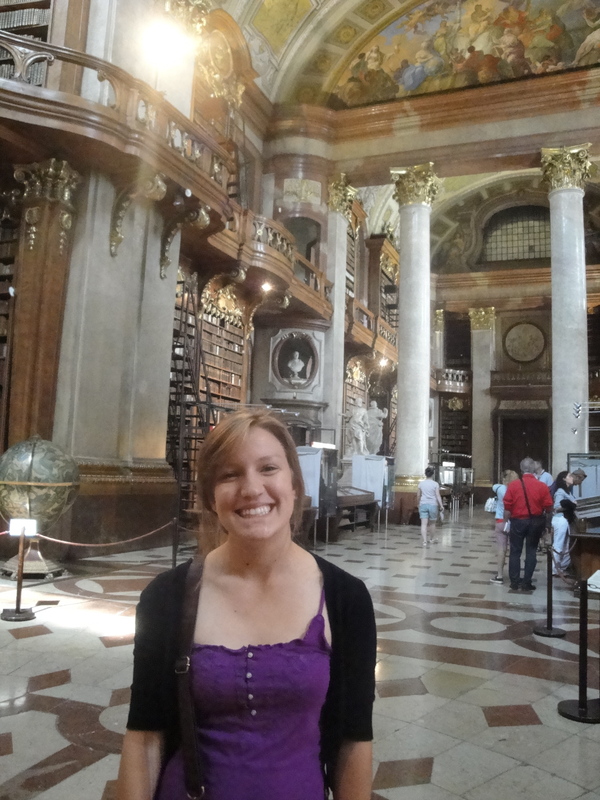 On Saturday, I went with a few girls from our group to the Austrian National Library, which really was a highlight of my entire trip to Europe. 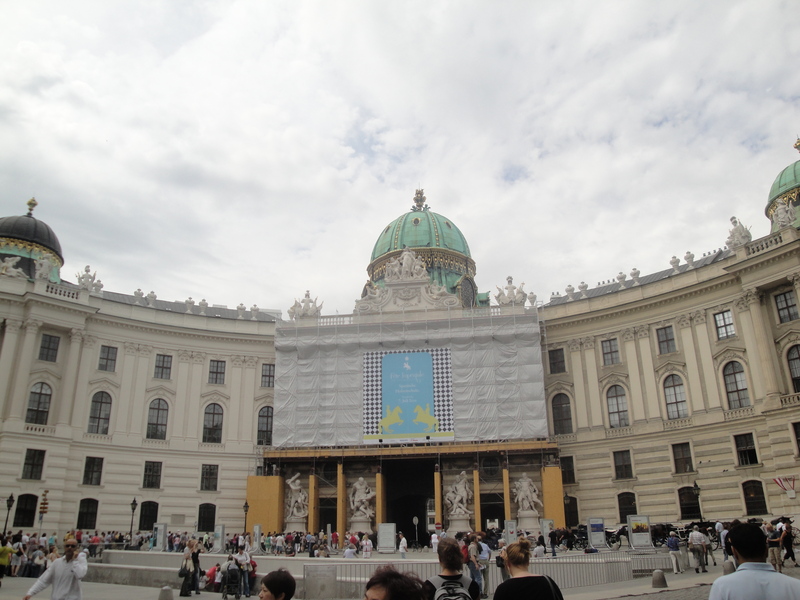 It was absolutely beautiful, and the museum exhibit set up inside, which details the history of the Austrian Empire, was awesome. I really can’t explain what made it so cool. So don’t take my word for it, you should totally go yourself if you ever get the chance. Mozart’s grave was quite anticlimactic, but walking through such an old cemetery was certainly thought-provoking. The way I see it, the deaths of the people buried there cease to be sad, but rather historic; the overgrown vegetation throughout gave it kind of a romantic, “Secret Garden” type look, too. Seeing the grave triggered some thoughts about the course of history, too–the fact that it’s even possible that a man whom we now regard as a genius was penniless at the time of his death and thrown in a mass pauper’s grave, and now we have to guess whereabouts he was probably buried in order to honor him. 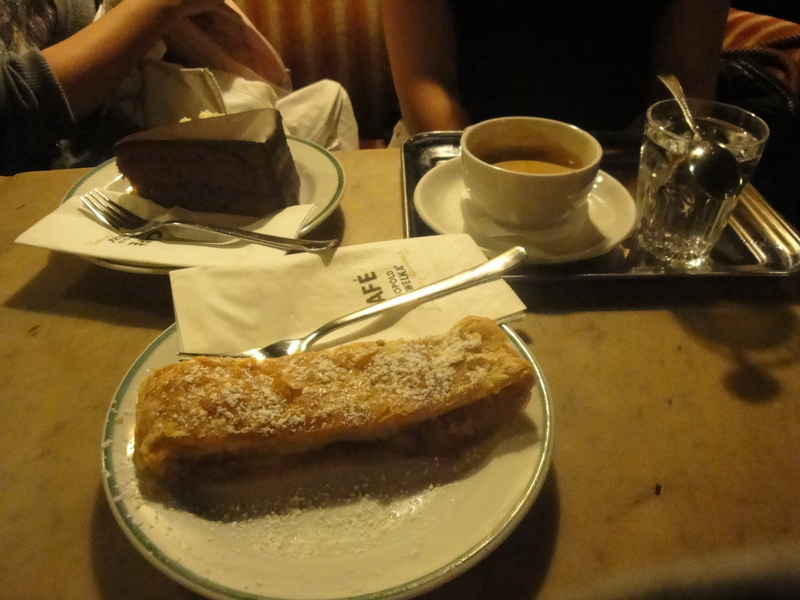 We ended the trip on a tasty note–first, at a Viennese coffee house (not overhyped at all!!! SO AWESOME) partaking in their trademark chocolate cake, Sachertorte, and then dinner: Wienerschnitzel as big as your face. Quite delicious, if I do say so myself. This was my one of my last big trips during my time in Europe. 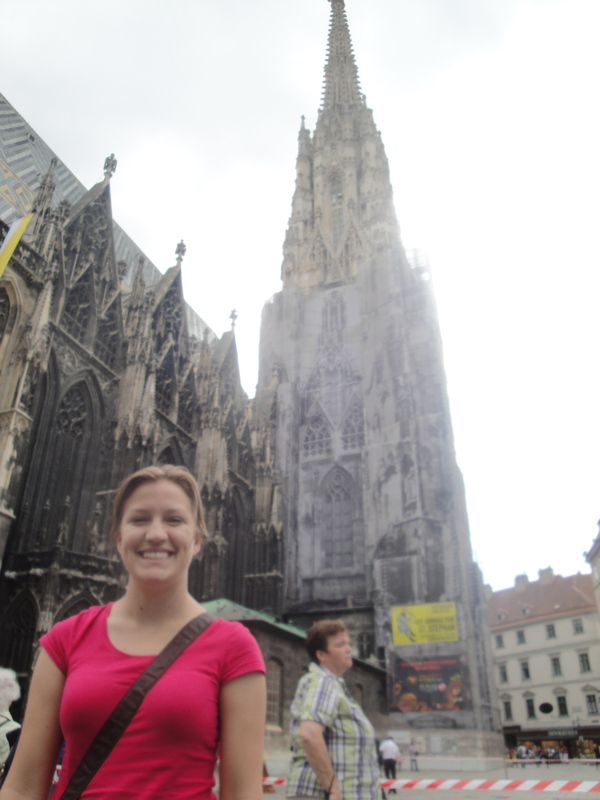 Kind of bittersweet–but overall I absolutely loved my time in Vienna. I’m in Freiburg for the next 2 weekends, which, frankly, I am stoked about! Tonight I’m headed to a bonfire/barbecue in honor of the Feast of St. John the Baptist (which was a few days ago… but whatevs!) and tomorrow I’m celebrating Canada Day! Bailey and I decided to room together on April Fools Day of our senior year. (Really, Bailey coerced me into living with her. No joke.) Btdubs, happy belated roomie anniversary, Bailey!!! We’d known each other since the beginning of middle school and had become good friends through our church our last two years of high school. It was really nice going into such a new (and BIG) environment already knowing someone, having someone to check in with every day and have RENT sing-a-longs wth and sit with at football games. It was especially nice the first few weeks. 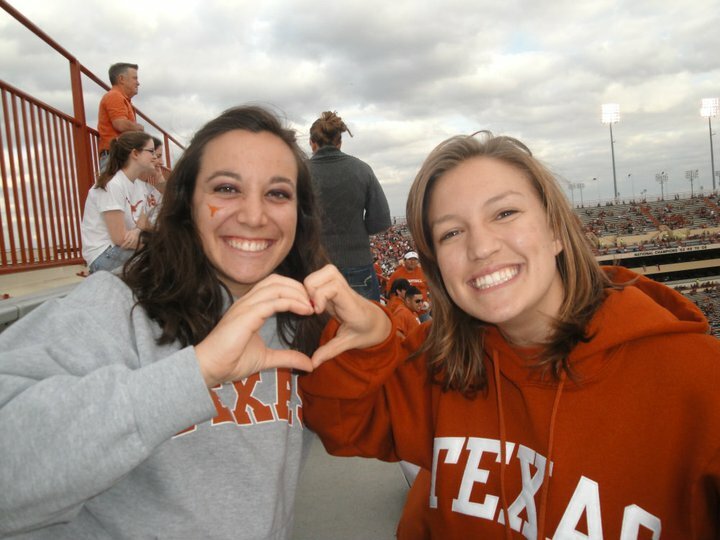 I distinctly remember, after UT’s first home game, from which we left early because we were demolishing the Little Sisters of the Poor or whomever we were playing, suddenly realizing that we didn’t have anything to do or anywhere to go. Because we didn’t know anyone. So we just had some frozen yogurt together and went to her sister’s apartment to play Apples to Apples. Yes, we do go to America’s #1 party school. Ha. Now I’m going through all that again, except I don’t have a roommate, and I don’t really know anyone here. So I’m having to re-learn the Natural Progression of making friends. Freshman year, I moved into the dorm a few days before Bailey did. One of our suitemates had also moved in early, so the first night I was there, she invited me over to her room and we chatted over pizza. 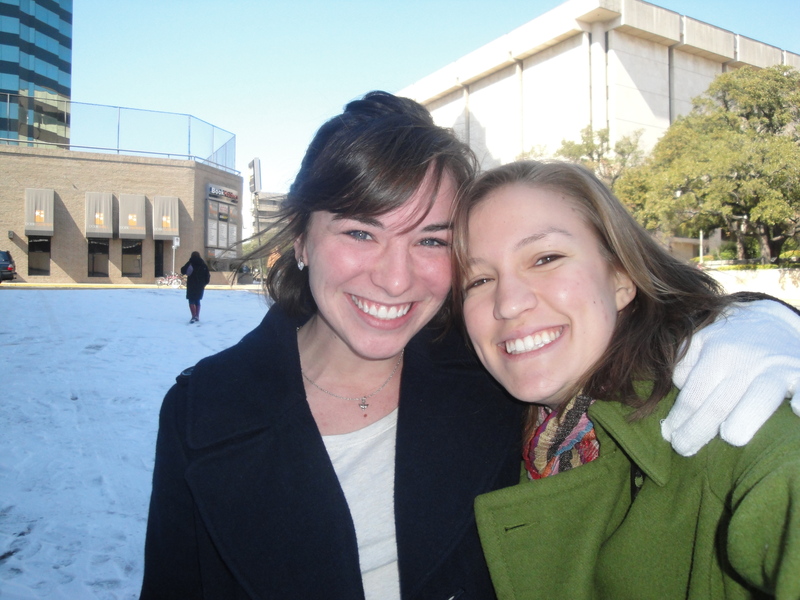 About lots of things–how her week was going with rush, our mutual love for The Office, and our respective roommates, since we each were rooming with a friend from home. That was pretty nice. I liked her, and we had a lot in common, and I figured we would be pretty good friends. In the case of my friendship with Julianne, it didn’t really Naturally Progress much further than those first few conversations. We would run into each other in the bathroom the four of us shared, and sometimes on campus, and we would comment on each other’s Facebook statuses occasionally. Whenever it was one of our four suitemates’ birthday, the others would decorate the bathroom for the occasion. (This is still one of my favorite dorm traditions! You better believe it is happening in our apartment next year!) But anyway, that is a relationship that didn’t really go much further than the first few interactions. Which is fine. 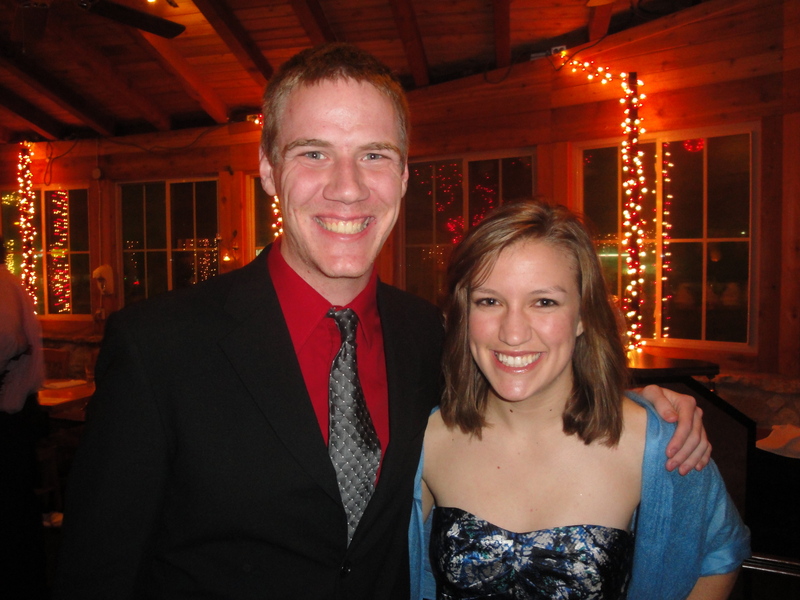 I made really good friends, and I hope that Julianne also did, and we both enjoyed our respective freshman years. This is a pretty good example to me of how I should approach meeting people here. I really don’t want to force friendship. I have gotten lots of advice about being bold and not being afraid to take the initiative when meeting people. Which I completely get. It is a little bit out of my comfort zone because I am pretty introverted. With each of the people I’ve met so far (which is about two… but still), I think I’ve done pretty well. You know, introducing myself, talking about where I’m from, and the real talking point–the fact that I already know one of our other hallmates from back in Austin! Super coincidental, right, that they’d put two of the three exchange students from UT on the very same floor of the very same building? Crazazy! Anyway, I am not going to get caught in the mentality that I need to be best friends with each and every person I meet, especially the first few people I encounter. Because that is just not realistic and would be setting myself up for some disappointment. But I really do appreciate the kindness of those I’ve met so far, in speaking German with me and being patient with my lacking language skills. I trust that, with time, these relationships will become what they are supposed to become. We are all going to be living in the same area (and sharing a bathroom and kitchen, for crying out loud) for a whole semester. Interactions will happen, and hopefully they will be meaningful ones. But if not, there are so many more people I have yet to encounter here. Classes don’t start for like 3 1/2 weeks, I haven’t been to too many church functions yet, and I haven’t had the opportunity to join any clubs or, really, interact with any students besides the ones who live on my floor. So it will come with time. I keep reminding myself that most of the meaningful friendships I’ve made (with some notable exceptions…) have all taken time–some of the people I call my closest friends now were just nameless faces in a club meeting or classroom the first time I encountered them. Like this guy! The first time I talked to him (a horrible, awkward, mandatory German conversation in GER328) I had no idea who he was. A year later, we were co-staffheads on LA50 and now he’s one of my best friends. Now, just like then, I just need to be patient. I need to go wash my dishes when I know there are other people in the kitchen instead of waiting till it’s empty. I need to try out my German even though I’m scared and kind of embarrassed by it. Because that’s what makes relationships happen, by golly. Yes, love planted deeply does become what it ought to be. These next four months will hopefully be a case study in this philosophy. So, I have hope. I do. The Progression doesn’t fail.